What’s in the Berkeley Pit water? Posted by PitWatch | Saturday, July 6th, 2013 | FAQ, Pit Info, Science, What's in the Water? The water level at the Berkeley Pit has been recorded every month for more than 23 years. 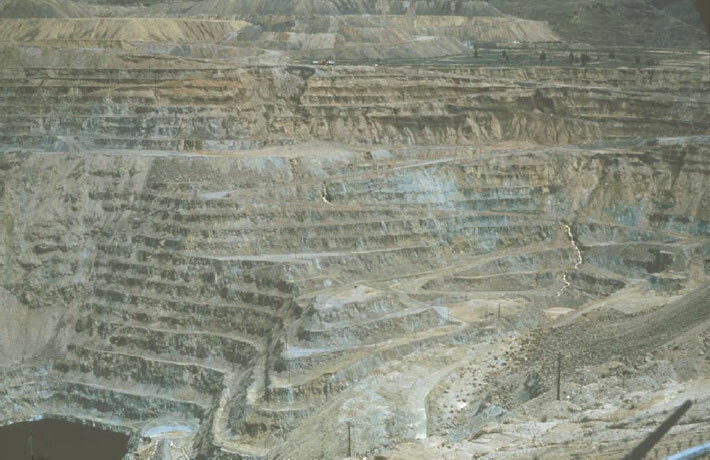 In addition to that monitoring, scientists at the Montana Bureau of Mines and Geology have been sampling and analyzing water from the Berkeley Pit twice a year for its chemical composition and physical properties. In the Berkeley Pit, samples are taken from anywhere between three to nine different depths and analyzed for various dissolved chemicals. 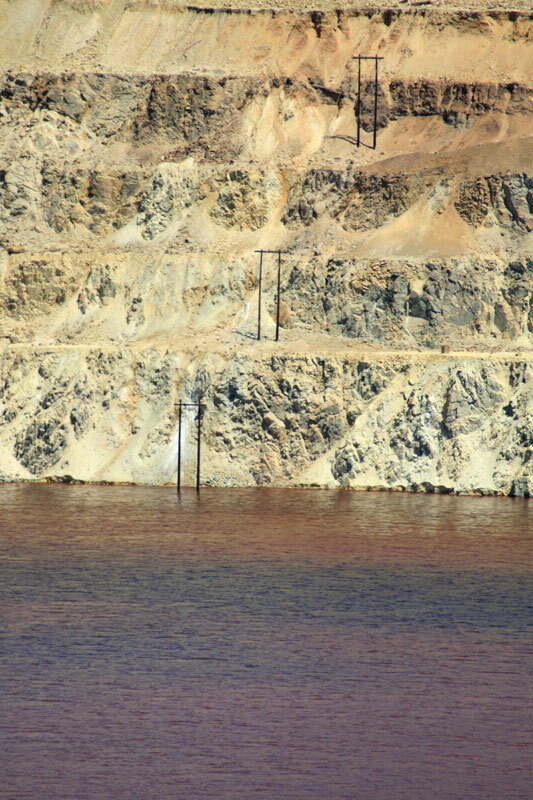 Berkeley Pit water quality has shown changes over time. It is regularly monitored by the Montana Bureau of Mines & Geology. The reddish color typically observed is due to high concentrations of iron solids. Water quality conditions, such as temperature, pH, specific conductance, and dissolved oxygen, are also measured at five- to ten-foot intervals from the surface to a depth of 600 feet. These same conditions are also measured at a depth near the Pit bottom. 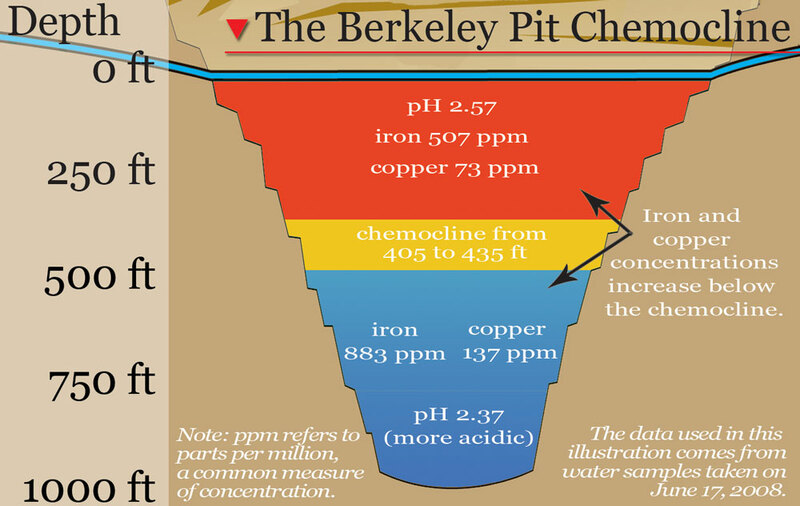 In past years, the Berkeley Pit was a chemically layered system, which means that the chemistry of the water changed with depth. The brownish-red water at the surface was actually the least contaminated water in the pit, and the lower layer the worst water quality. The color changed as well, going from brownish-red on top to bluish-green at the bottom. At a certain depth, the chemistry of the water changed so rapidly that it formed a chemical boundary scientists refer to as a chemocline. Water above the chemocline was chemically lighter, in other words, less dense, than the water below. The layering of the two waters is similar to oil floating on water. The water above the line was also less acidic (higher pH), with lower concentrations of metals. A chemocline, or a difference in water chemistry depending on water depth, was seen in the Berkeley Pit prior to about 2012. Mixing of the water in the Pit lake over time has caused the water chemistry to become more uniform. Click on the image to view a larger version. Due to mixing in the Berkeley Pit lake over time, this previously layered system disappeared around 2012, and the Pit water has since become more uniform.